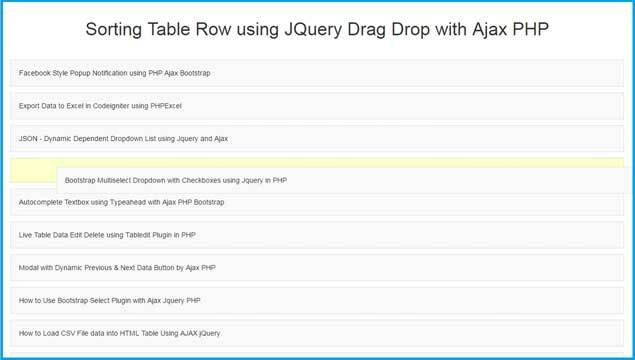 In this post, We have learn how to sort table row by using Jquery Drag and drop with Ajax and PHP script without refresh of webpage. If you have use Wordpress then in admin dashboard you can find this type of feature. By using this functionality we can easily rearrange table row data with easily user interface. User can also easily sort table row by using Drag and Drop html element. Here we have use JQuery UI drag and drop library sortable() method. By using this method we can easily move any HTML from one place to another and particular element will be placed automatically and it will be sort element. But when we have refresh web page then HTML will be arrange according to its orignal place. But we don't want to change position of HTML element and get HTML element position as per our drag and drop. So for this here we have use Ajax with PHP script. So when we have move HTML element then we will fire Ajax request send to server with all table row id with index order and in PHP script it will update table row order data according to index position. By using this feature User can easily sort table row by simply drag and drop HTML element and User can easily understand this type of interface. If you have developed any web based application, then you should use this type feature for make User friendly application and user can easily used this application. Below you can find complete source code of this tutorial and also get online demo also.